The Leisure and Cultural Services Department in Hong Kong attaches great importance to providing high quality facilities to the public. The new swimming pool complex in Area 1 (San Wai Court), Tuen Mun, is a state-of-the-art $790m development. Outdoor facilities include a 50x25m main pool with a 1,200 seated capacity spectator stand, a 25x15m outdoor training pool and a 25x15m outdoor teaching pool. Thorn Lighting Hong Kong was commissioned to provide the floodlighting for this fantastic outdoor space with the aim of providing high quality task illumination. 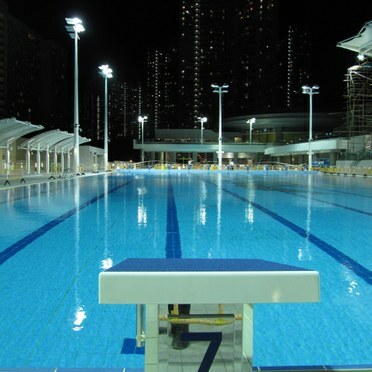 Thorn’s Champion and Mundial C metal halide floodlights were chosen to illuminate the three pools. Champion is a high performance floodlight for training grounds with best in class optic control of obtrusive light. The 1kW projector incorporates a flat glass concept and an integrated visor for total control of glare and obtrusive light. Champion offers maximum optical efficiency and accurate light distribution with minimum light spill. The Champion floodlights were applied to achieve 0.5 uniformity. This ensures there is enough variation to prevent bland uniform light but with no excessive contrasts. Visual dark spots in the pool could be dangerous in the event of a swimmer having problems. Similarly, Mundial C is a high power and high performance floodlight specifically designed for all sport applications and large area illumination. 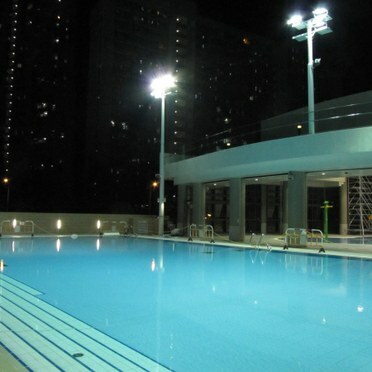 With the lighting applied to highlight the pools’ turning ends, the 1kW hot restrike lamp version was selected to ensure there is no loss of lighting, which would be dangerous for both swimmers and those surrounding the pools. Computer optimised optical systems combined with unique optical construction ensure glare is kept to <56 on the water surface whilst lighting to the bottom of the pool for maximum swimmer safety. Excellent glare control is important to ensure pool attendants’ have a good view of swimmers, as well as the comfort of spectators, the surrounding residents and local wildlife. The quality IP65 rated luminaires and asymmetric distribution allow the fittings to be positioned on the edge of the pool for ease of maintenance and safety. Mundial C is particularly easy to install and maintain with rear access and automatic power interruption.